Ridden by Irishman Wayne Smith, Brilliant Debbie was tailed off a long and lonely last from the jump in a race run at good speed set up by Thehorseiswithme. Still a clear last at the top of the Smith bought the bay son of Sepoy to the centre of the track to weave a passage into clear running, with Brilliant Debbie exploding down the middle of the track to race away for a one and a half lengths victory over favorite Mister Kaopu (Ruan Maia), with Obrigado Mais (Breinell Yamzon) running on soundly for third. Brilliant Debbie is prepared by the joint stable of Tommy Tse and Louis Ho, with Ho being the primary trainer of the gelding. 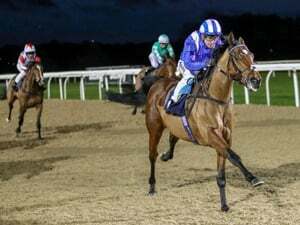 The five year arrived in Macau in January of last year and was confidently supported at his first start on the sand in March before running a poor 5/11 over 1350 metres. The gelding was found be lame after the event. It wasn’t until November last year that Louis Ho was able to put those problems behind him, with Brilliant Debbie putting paid to a good quality Class 3 field over 1200 metres under apprentice Eric Cheung. Other good runs followed and a few minor placings with the five year even tried up to 1800 metres. However it was the freshen up and back to 1200 metres that did the trick, aided by a soft track and a cracking pace. Brilliant Debbie was originally prepared in Ireland by Jessica Harrington when racing as Khukri winning a Two Year Maiden at The Curragh and a Three Year Old Stakes at Navan. The gelding’s two wins and two placings in Macau have netted the owner Mr. Chan Clament over $650,000 HKD to date. Stanley Chin enjoyed a great night on Friday winning three of the six events on the card to bring him up to 23 winners for the season. Benevolent Friend was the first of Chin’s winners when he saluted off a perfect ride by champion jockey Ruan Maia to win the Class 1 & 2 over 1350 metres on the sand. The Brazilian had the English import in the perfect spot in the run behind a line of three leaders on the bridle. Driving the son of Oasis Dream (GB) between runner’s on straightening the seven year bounded away for a good win over Duke De Vega (Peter Ho) with Oriental Profit (Kevin Leung) flying home for third. reatest Prodigy under Luis Corrales was the second of Chins winners when he went home to well for his opposition in the Class 2 & 3 over 1510 metres; then Hugo And Barry (Fausto Henrique) showed plenty of grit to edge out River Double (Eric Cheung) in the Class 6 over 1350 metres. 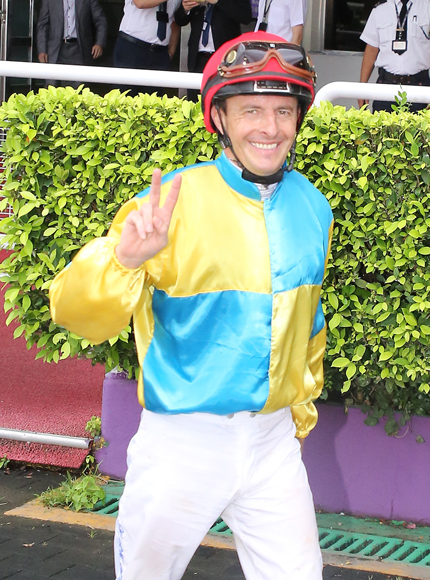 Chin now moves into equal third spot on the Trainer’s standings with Tony Fung on 23 wins apiece. Sio Cheong the Champion trainer from the 2015 – 2016 season leads the race on 25 victories from Alan Tam (24). The joint stable of Tommy Tse and Louis Ho are giving a great sight for a small yard and are currently in fifth spot on 22 wins. Tse and Ho have the best strike rate by far with only 127 runners for the season for 22 wins, 16 seconds and 12 thirds giving then a win rate of 17% and a place rate of 39%. 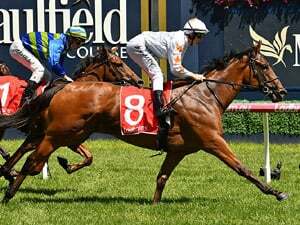 The upset of the weekend was the bolter Trillion King who relished the soft conditions to romp home in the Class 3 & 4 over 1500 metres on the turf on Saturday. Ridden by Frankie Choi, Trillion King was friendless in the betting and jumped at odds off $623.50 for the win. 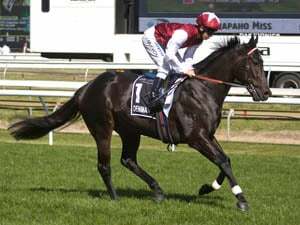 The son of Myboycharlie was formerly trained at Newcastle by Kris Lee’s where he raced as La Pont winning a Scone maiden over 1100 metres and a Newcastle BM 64 over 1400 metres on a heavy track. Prepared in Macau by Sio Cheong the four year old looks to have a decent future especially in the summer months with the rainy season approaching.